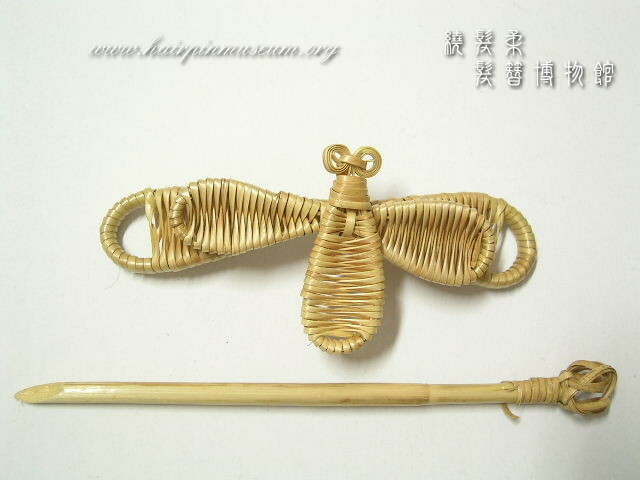 Wood has always been used to make decorative objects and it is not a surprise that it is also usd to make hairpins. It is light in weight, easily carved, soft and warm to the touch. However, being an organic material wood will decay quickly in the ground and is also easy food for insects, fungi and other pests. 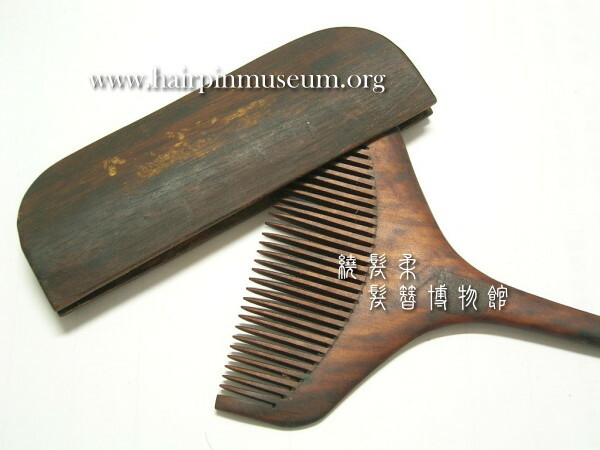 It is quite rare for wooden objects to be found in graves unless the soil is very wet or very, very dry. Here are some wooden combs. The one on the left was recovered from a grave. It has survived because the soil in the grave was always wet and had little oxygen. However, when wet and degraded wood dries out it often shrinks and distorts. 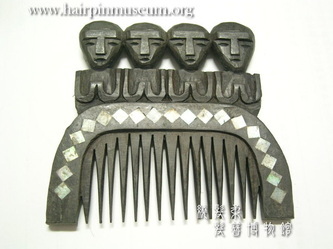 The teeth of the comb are twisted and irregular. Some teeth are broken and missing. Click the pictures below and see the larger pictures. 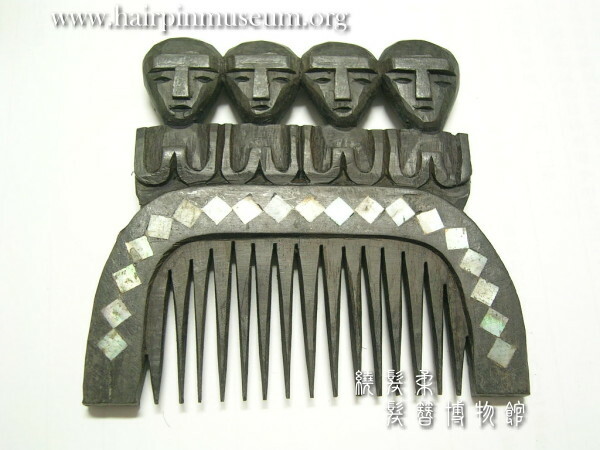 The other two combs have never been in soil and are in much better condition. 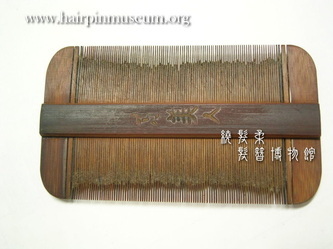 The comb in the centre is decorated with inlaid shell (mother of pearl). See the section on Hard Tissues to read more about shells. If the hairpin is made from bamboo or another plant fibre then it does not even need to be carved. 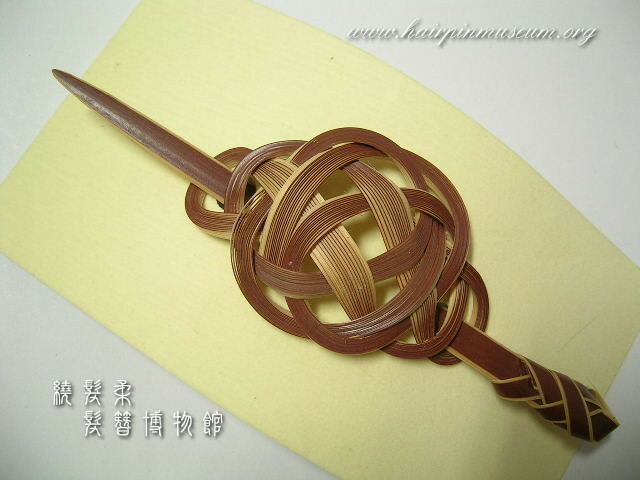 Beautiful shapes can be made by twisting, weaving and knotting the flexible plant fibres found in bamboo and some grasses. On the hair clasp on the left the natural differences in colour in the bamboo have been used to enhance the decorative effect. Paper or cardboard are cheap, light in weight and can be decorated easily by dyeing and printing to make elaborate patterns. They are, however, not very durable and will quickly become torn, broken, faded and ugly. 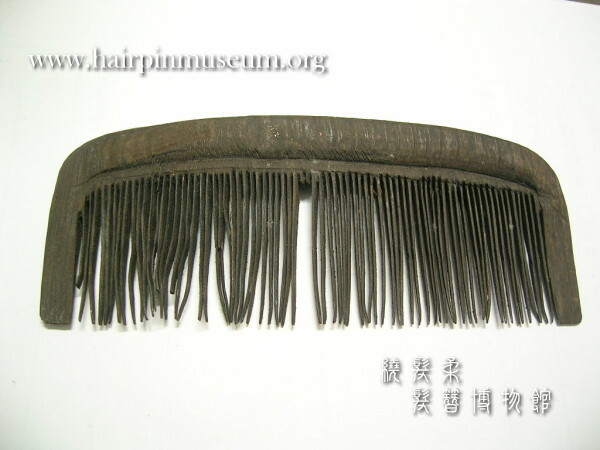 For this reason paer hair ornaments and hats were normally used for occasions when they might be worn only once - for example at weddings and other cermonies. 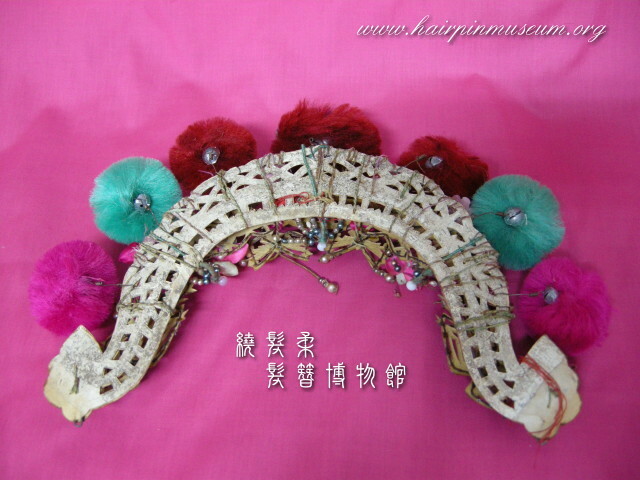 Alternatively, they may be used as stage costumes for the theatre or opera where they will not be seen close up. 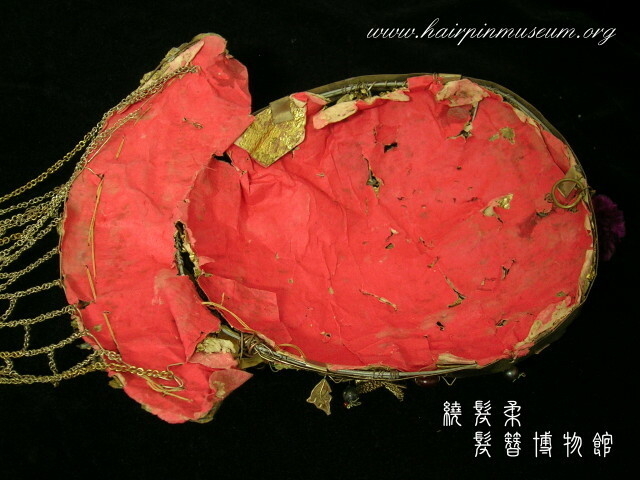 In ancient China, wooden objects were closely related with lacquer ware. 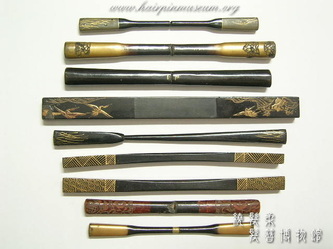 Lacquer can prevent decay in wooden objects and acts both as both protect and decoration. 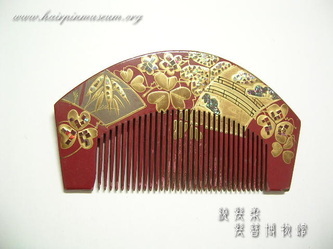 This can be seen in many Japanese hair ornaments which are always painted with a layer of lacquer in a beautiful design. 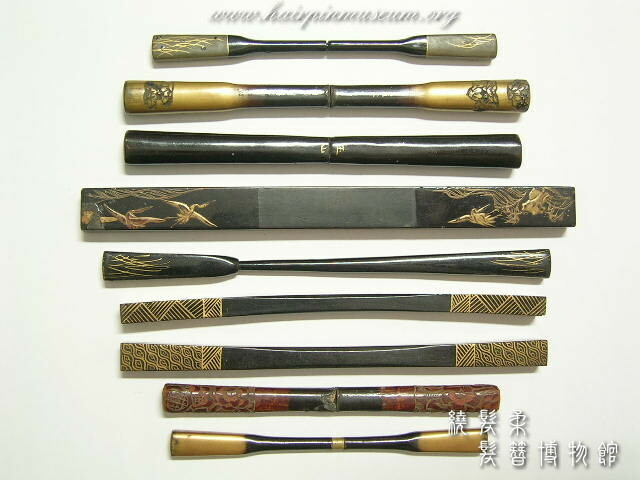 The wood quality should be very hard and compact and it should not easly change shape or the lacquer will crack. 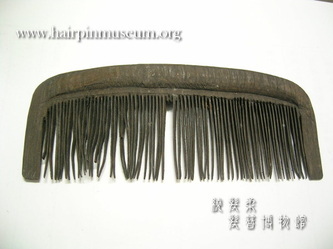 The addition of lacquer to wooden hair ornaments makes a cheap material more beautiful and valuable. Generally, Japanese wooden combs do not focus on the design which can be quite simple but the emphasis is on the lacquered decoration.